Discover all the wealth of Ardèche through memorable landscapes, extraordinary visits to typical places; you will be amazed when strolling through the small alleys, on the hiking trails or at the summer markets, etc. Aubenas is a medieval town, you can visit the castle (guided visit of about 1h40), as well as the old town center with its little streets, and the castle square surrounded by old houses. On this place you’ll also do the markets on Saturday and Wednesday morning. And more in July and August, with the night market. 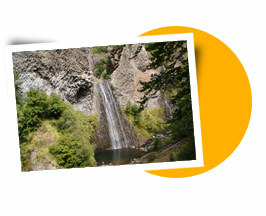 The Ardèche is full of remarkable sites, with volcanoes and numerous caves. 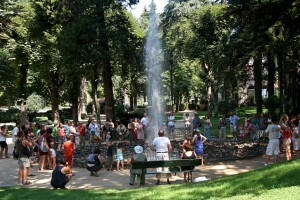 The campsite is situated in the Regional Park of the Mounts of Ardèche, a preserved nature. 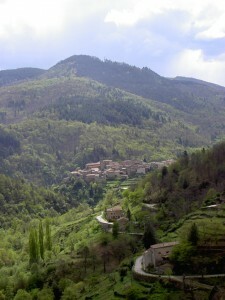 The Regional Park of the Mounts of Ardèche offers an extreme variety of landscapes, historical and natural sites. Discover this region walking around and tasting the most famous products of Ardèche made of chestnut, honey or wine de Chatus. The sites you have to see are the Pont d’Arc (natural arch of 60 m high, entrance of the Gorges of Ardèche), the Mont Gerbier de Jonc (1550 m high, great natural site), the waterfall of Ray Pic (waterfall of 35 m, and geological site of interest), the Lake of Issarlès (lake of crater of 97 hectares), caves, the Pont du Diable (Devil’s Bridge), volcanoes of Ardèche, the spring of Vals-les-Bains, the wine domains, beautiful villages such as Vogüé, Antraigues and Balazuc, the evening markets in Aubenas and Vals-les-Bains. 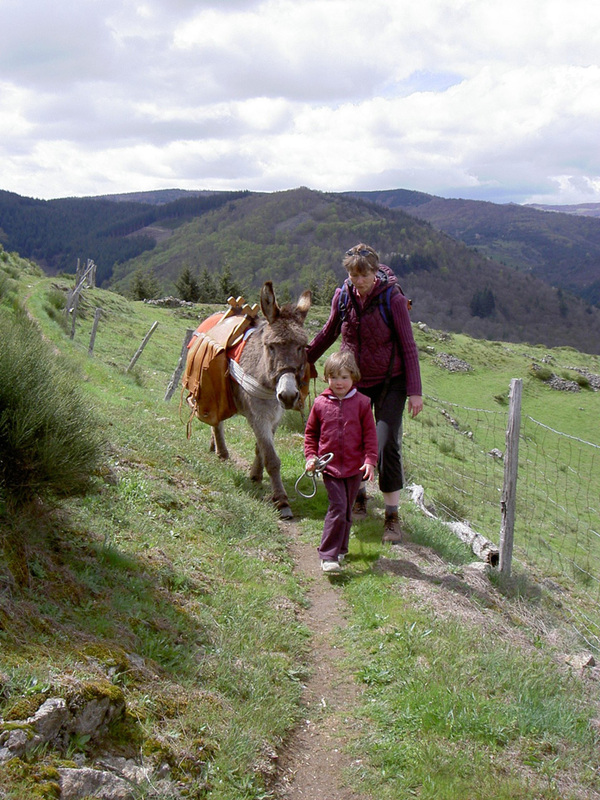 Many hiking are marked, starting from Vals-les-Bains and Aubenas. Leisure such as water sports (canoe, canyoning), outdoor sports (horse-riding, speleology), and theme parks… will enjoy your days! At the reception, you can make your reservation in advance, for your trips in canoe, speleology and canyoning and courses in tree swinging. 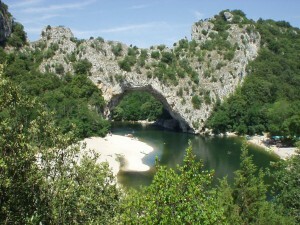 Symbol of Ardèche, The Pont D’Arc is a natural arch of 60 m long and 54 m high burrowed by the Ardèche River located 5 km from the town of Vallon Pont d'Arc. It’s a curiosity unique in France. 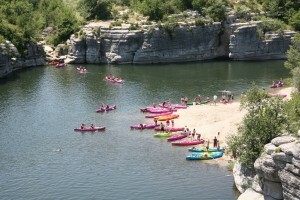 A place for canoe enthusiasts, as well as being the natural entrance to the Ardèche gorges. From Vallon Pont d'Arc to Saint Martin d'Ardèche about thirty kilometres long, the Ardèche Gorges are a unique natural wealth. Possibility of canoeing / kayaking or visiting the Gorges by road with many view areas. Discovered in 1994 in Vallon Pont d’Arc, the Chauvet cave is one of the oldest ornate caves in the world! This prehistoric work of art is ranked in the World Heritage of UNESCO. Discover the history of Silk and yesteryear Ardèche in Alphonse Daudet’s family farmhouse. Perched on a cliff overlooking the Ardèche, the former stronghold of the "Lords of Balazuc" retains many traces of its medieval past. 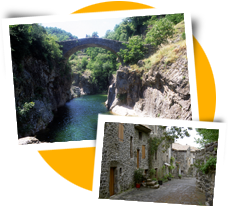 The ancient village is built like an amphitheatre over an Ardèche River beach and is one of the most famous scenic and picturesque places of the Bas Vivarais. Located 470m above sea level on a volcanic peak, the village of Antraigues sur Volane, classified as "village character", is named after the three rivers that surround it: the Farmhouse the Volane and La Bise. 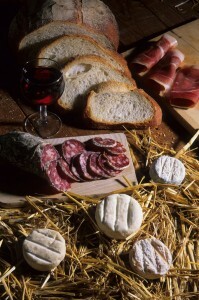 There’re numerous local products in Ardèche. The most famous and symbol of the Ardèche: the chestnut in all its form (jams, cream, beer…), to learn more, go to the Châtaigneraie museum. For the cooked pork, you’ll have to taste the Caillette. And for the cheese, the famous Picodon (goat cheese). You can also go for a walk in the wine domains and taste our local wines. And to help digest all of this, nothing’s better than the Vals Water ! With the European Days of Heritage, discover monuments usually closed to the public. « De Ferme en Ferme » in April. « Mon Pays ma Fête » in May. Many festivals are organised in July and August (Labeaume en Musique, festival Aluna). For further information about the region, you can have a look at the website Ardèche Découverte, which is the Ardéche tourism portal site: Accommodation, Gastronomy, Sports and Leisure, Discovery, Agenda and Events.